Follow A41/New Ferry By-pass. At the roundabout take the 2nd exit onto A41/New Chester Road. At the roundabout take 3rd exit and stay on A41/New Chester Road. At the traffic lights turn rignt onto Ivy Street. 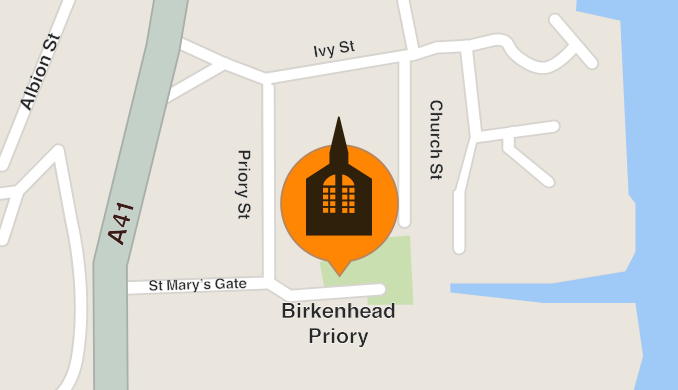 Take 2nd right onto Church Street, follow to the end for our free Priory Car Park or on street pay parking. Follow to roundabout by Seacombe Ferry/Spaceport. At roundabout take 3rd exit onto A554/Birkenhead Road. At roundabout take the 2nd exit onto A554/Tower Road. At roundabout take 2nd exit and stay on A554/Tower Road. At the roundabout take 1st exit and stay on A554/Tower Road. At the roundabout take the 3rd exit onto A41/Chester Street. At traffic lights turn left onto Ivy Street. 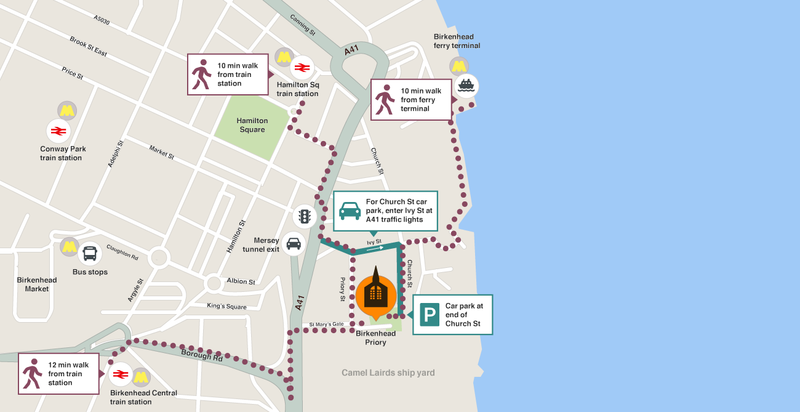 Take 2nd right onto Church Street, follow to the end for Priory Car Park – which is free or on street pay parking. From Liverpool City Centre (via Queensway Tunnel) Turn off Sat Nav! on exit from the tunnel bear hard left to seperate pay booth. Have £1.80 toll fee ready. At lights turn right in to Ivy Street, take second right onto Church Street. The free car park for the Priory is at the end of the road. About a 10 minute walk. 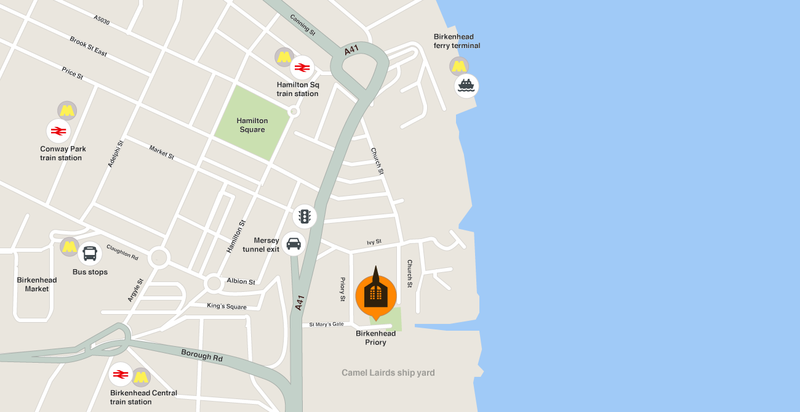 The nearest train station is Hamilton Square on the Wirral Line. From the station entrance turn right towards Hamilton Square. Walk across the Square in front of the old Town Hall. At the other side of the Square turn left onto Duncan Street. At cross roads turn right onto Chester Street – cross the road when safe to do so. Turn left into Ivy Street and then first right onto Priory Street. The Priory is on your left. About a 12 minute walk. From the Ferry terminal, turn left onto the promenade, follow the prom to Alahabama Way. Turn right here and then left at the cross roads onto Church Street. Walk to the end of the road and through the car park to the Priory. You can get the bus to Woodside and follow the directions from the Ferry. Bus routes 464,487,423,437,1,2,407 stop on Chester Street. From Chester Street turn into Ivy Street and then first right onto Priory Street. The Priory is on your left. At the roundabout take 2nd exit and turn left onto Campbletown Road. At the roundabout take 4th exit onto A41/New Chester Road. Turn right onto Ivy Street, then first right onto Priory Street. The Priory is on your left and the bike racks are on the wall opposite the toilets. Due to the nature and location of this site, there is uneven but level access around most of the grounds. Stairs render some parts of the site unavailable to all visitors. feel free to bring your own picnic along. Guided tours are available – just ask at the information point.